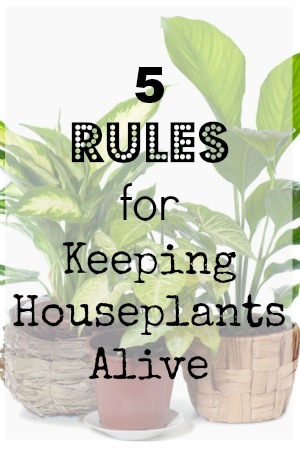 Keeping houseplants alive and thriving is not the easiest for everyone, but its not altogether impossible. Everything depends on the plant that you bring into your home, where you decide to place it and how much attention you give, or remember to, it. There are a few simple rules for keeping houseplants alive, and it starts from the moment you decide to bring a plant into your home. Carefully consider each of these simple rules and tips to keep happy healthy plants growing in your home for many seasons to come. Before you even own a plant there are a few things you need to consider. First, do you have a place where a houseplant can live. Is there a sunny window? Do you have a windowsill or counter space free? Potted or hanging? Once you have these basic questions figured out and a place ready for a plant, you can shop smarter for a plant that can have its specific needs met based on what you can provide. It took several years of my husband buying me certain plants that I killed within about 6 weeks before we realized that, just because a local store is selling it for a holiday, that doesn't mean that we can keep it alive once the holiday is over! Don’t just grab the first plant you see and like. A successful plant is the one that is already in good health and will not die quickly after being moved to an entirely new environment. Shop at a nursery where care is given to the plants, not where plants are just stored till they are sold. Big box chains are great for price, but they do not care for their plants and their individual needs the same way a nursery will. Look for plants that are watered, have clean leaves and that do not have roots hanging out of the bottom of the pot– something that indicates plants that have outgrown their pots a while ago. As for the flower itself, pay attention to what stage of growth it is in. If the plant it already wilting or has leaves that are dying back, pass and find a plant with flowers that are just beginning to bud. Watering is where most folks tend to kill their houseplants, either over or under watering the plant because they don’t know how much water it needs or forget to water it for long spans and then drowns it in one episode. Find out what your plant needs first and try to stick to a routine. If you notice brown leaves, you aren’t watering enough. If your plant’s leaves are turning yellow, it needs less water. Pressing down on the soil should never result in water pooling on the surface and soil should also never be dry enough to be removed in a single clump. A clean plant is a happy plant, because a clean plant can breathe. Dust settles on everything in the home, and you are not about to let dust collect on your plates so why would you let it collect on your plants. Regularly dust the leaves of your plant so that they can take in air and sunlight. Its also a great idea to give flowers some time in the bathroom where it can enjoy the steaming atmosphere when you shower. The steam will collect on the leaves and naturally wash away dirt, as well as work like a plant spa day. Finally, all plants will eventually outgrow the space they have been planted in and need to trade up. As soon as you start to see roots on the surface of the soil, sides of the pot or growing out the bottoms of the pot, it is time to move your houseplant to a bigger container. Always get a pot that is able to drain itself which will help a case of overwatering. The pot that you choose should be two to four inches wider and deeper to give roots room to spread out. Add new soil and water well after repotting. « Is Wegmans Really More Expensive Than Other Stores?